Ah ... It's nice to get out of the box. I know all of you, Neo Geo players, like brawls, blood, guts hanging, the shower dripping, creaking bones and limbs torn off. Come on, it's not too late for a change. 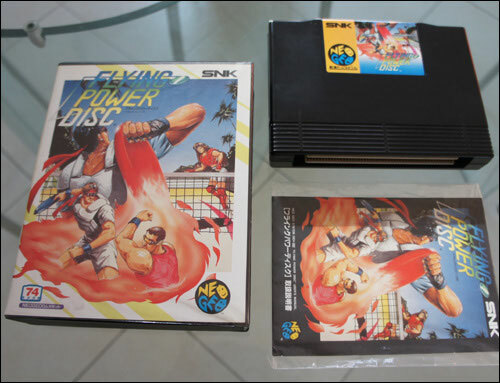 Forget the arcade stick, forget Kof, Street Fighter, Samurai Shodown, and others. How about playing some frisbee? 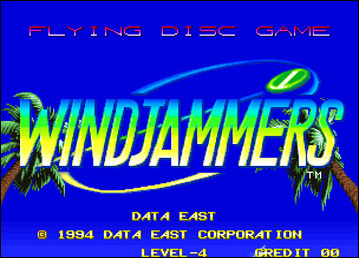 Yes, of course, said like this, well... Let me introduce you Data East's beautiful baby : Windjammers. 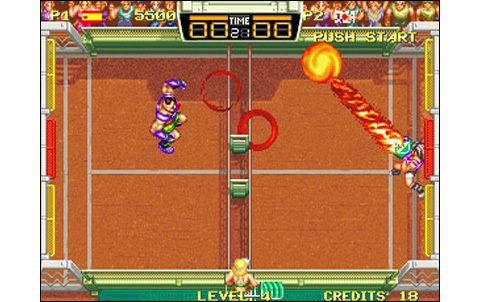 Released in 1994 among a host of hits for the Neo Geo, this game of frisbee, taking Pong's basics and adding it a few modern features and fun, offers to play as one of the six international players available, for some great games on six different courses, at your convenience! The game is a call to dream and holidays. 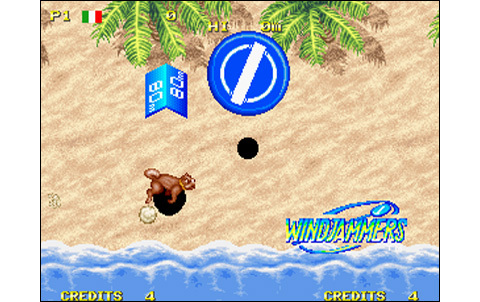 Windjammers smells good the hot sand and coconuts. Real exotic touch in a world of brutes, this Data East production invites us to originality and fun. What surprises await us inside? 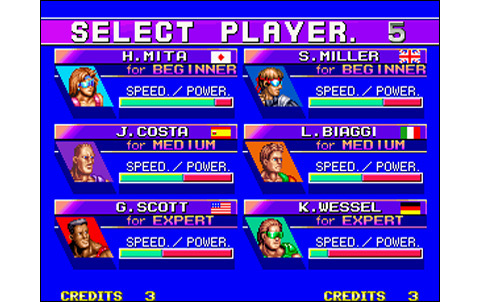 Well, it starts well with six different players to choose from, coming from all around the world with their own qualities and defects. 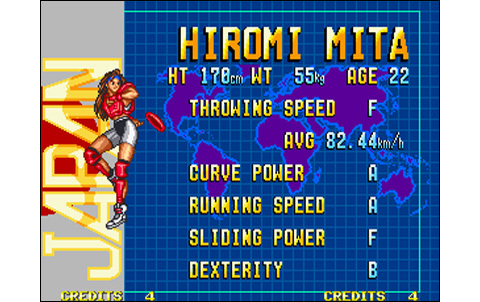 Each features a special attacks of his own, while the different characteristics to consider are speed, power, slide speed, dexterity and ability to spin the frisbee. You have to find which one suits you best, depending on your style. 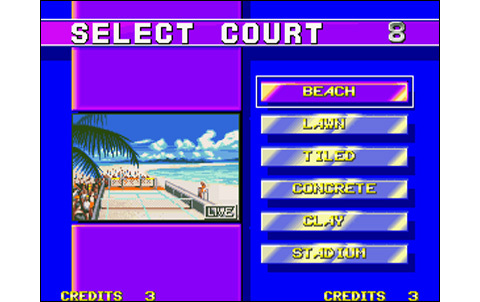 Then six varied courts are proposed, with some simple close playgrounds, some others more broad, and still others with 'traps' or other obstructions causing false rebounds. All this should be rich and interesting ... How does it play? 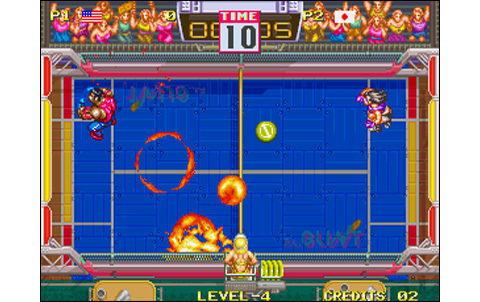 Like in tennis, you have to win two sets to win a match, and a third must be played in case of a tie. 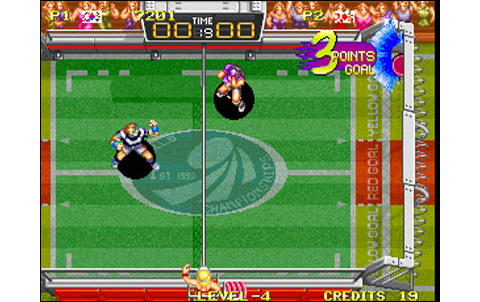 Then finally, if there's still a tie at the end of the regulation time, the game apply the rule of sudden death. 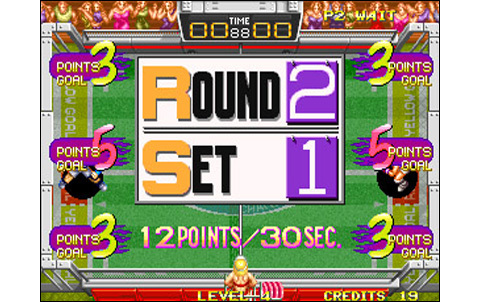 Players must score twelve points to win a round, and to make it you have to send the frisbee into the opposing goal (any part lying behind the opponent), a process which can yield three to five points depending on the point of impact. If the frisbee touches the ground anywhere in the opposite camp, you score two points. To help you smash violently your opponents, Data East thought about everything! 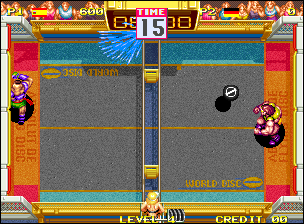 various effects, special moves, lobs, bounces... Indeed, it's even possible to bounce the frisbee against the side walls of the playfield... and this spices up things a bit! 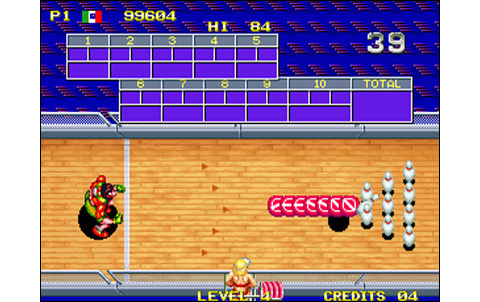 Two buttons are used: A for a normal shot or a slide, and B for a lob. The directional stick does the rest. Quarter-circles, half circles, various directions ... A full arsenal of technical throws is to be discovered here! Same for the lob, you can control its directon. To fully take advantage of all this technical stuff, your timing and accuracy will prove decisive. 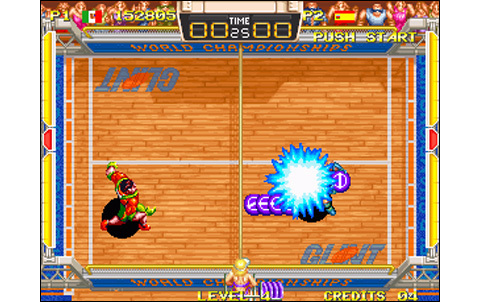 For example, when you press A to re-launch the frisbee (at the right time, it performs a very quick response) or do not touch anything while in the receiving axis to focus a super attack. Still other techniques exist, but you 'll have to get your hands on it! The single player game is addictive, with an increasing difficulty, rather well balanced. The matches are punctuated by some nice and original bonus courses in which we will try to break records. Fresh and fun! 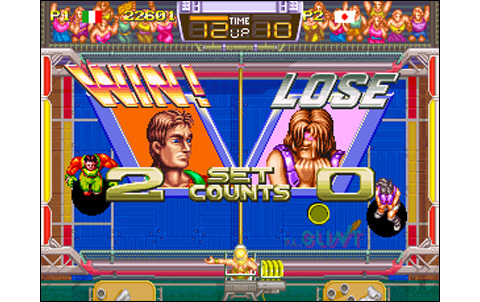 But the highlight of Windjammers is still clearly the VS games. Intuitive, addictive, brilliant... the game is technical enough to offer a great depth of play and an interesting line of progression. Games with friends are great hilarious moments, sometimes offering a rare intensity when the battles are tied! 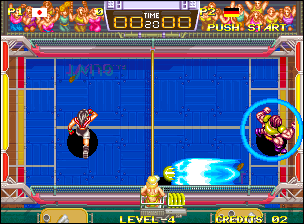 This is the great part of Windjammers, a fun present playing alone or multiplayer. 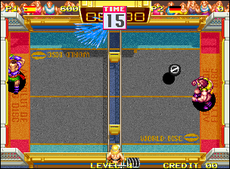 Technically, players are entitled to simple but colorful graphics, with few but varied arenas, making you feel on holidays in different countries. The animation, one of the highlights of the game, is very fast and well-decomposed, a true benchmark. 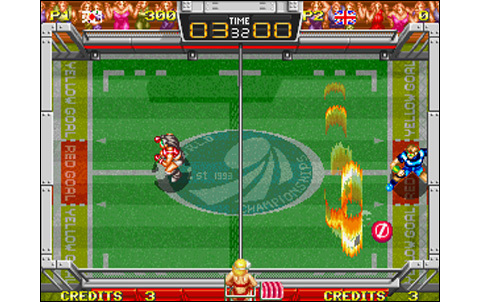 The characters are dynamic and lively, controls respond perfectly, and reflexes are highly involved. The soundtrack is also in the spotlight, with remarkable sound effects and beautiful voices, all assorted with nice melodies, but not too invasive. 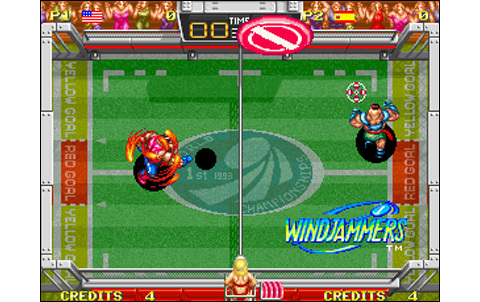 Bet win for Windjammers! Data East gets off the beaten paths and offers an original and well-crafted soft, full of good ideas and fun. The test of time, the game has passed it very well, with the simple principles taken from Pong and improved offering a gaming pleasure rarely seen. 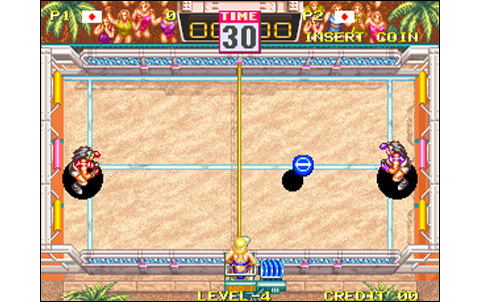 The two players competitions are a treat, and it's very difficult to let go of the stick once you started playing! A mega-hit from Data East, that totally deserves this title. With only six different backgrounds featuring simple but successfull designs, the game is not astounding in this chapter. Overall it's quite nice, without being very much varied. Speed is great, character's animations are smooth, and sets are alive: it's all good! Musics are just nice but you forget quickly about these, while sound effects and voices fit perfectly. 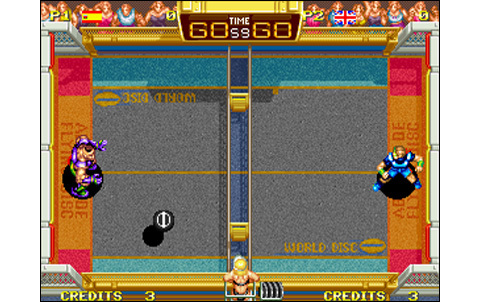 One-player game with a great challenge and six different characters to master, and a neverending two-players action! 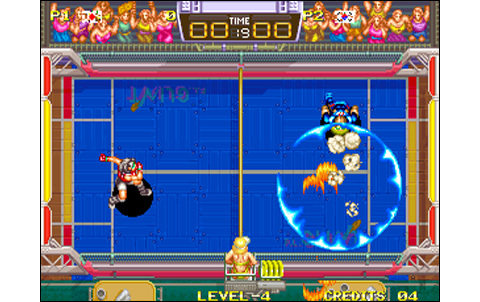 Taking Pong's basics and adding it more moves, more speed, more timing and more fun, Windjammers offers perfect controls and amazing gameplay. 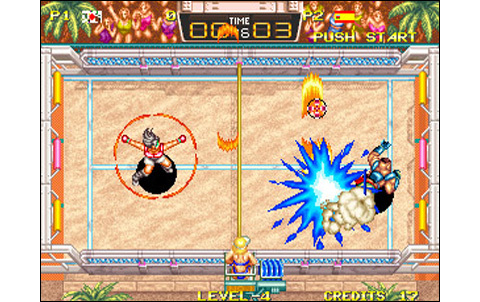 Pleasure, fun, deep gameplay, great sensations... Windjammers is the perfect VS game, original and timeless! 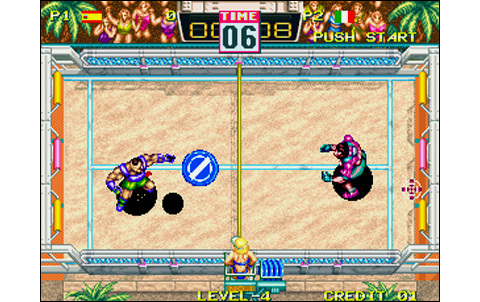 Windjammers stands as an essential golden nugget for the Neo Geo, which costs nowadays almost two hundred and fifty euros (mint japanese AES). Anyway... if you like playing videogames with friends, it's hours and hours of fun ahead.